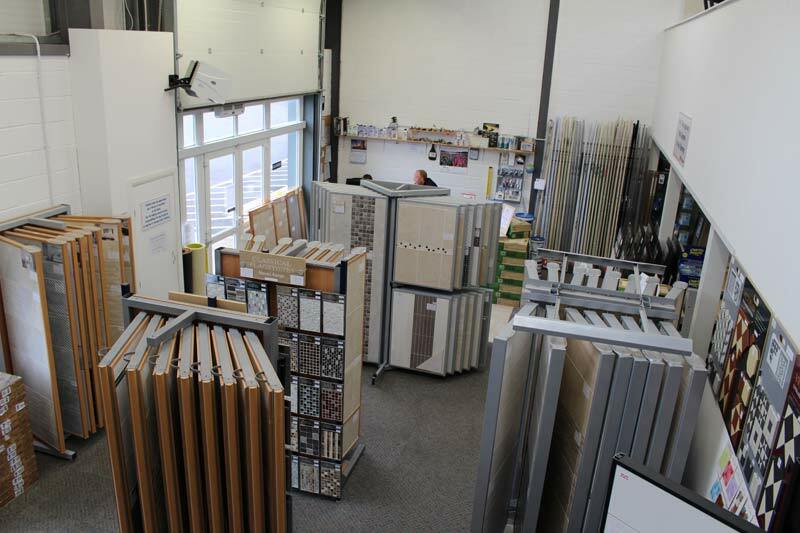 At The Tile Gallery in Chippenham, we provide a vast range of different tools, adhesives and grout to make your tiling project as straight-forward and efficient as it can be. We also provide quality underfloor heating from Warmup. For more information, please read on below or contact us by clicking here. We look forward to hearing from you. 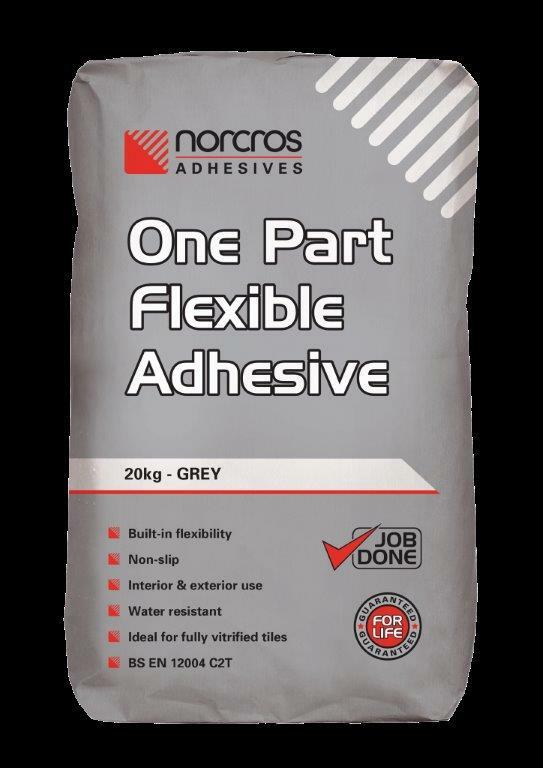 Norcros Rapid Porcelain Grey Tile Adhesive is a grey cement-based thin bed adhesive designed for fixing fully vitrified porcelain, ceramic and stone* tiles to a variety of building surfaces. It is water and weather resistant and is suitable for both internal and external locations. It has a setting time of 3 hours at 20oc permitting early trafficking of the tiled installation. Containing unique Rock-Tite™ polymeric binders the enhanced flexibility of the adhesive allows a greater range of fixing possibilities normally only achieved by the addition of separate admixtures. The adhesive has excellent thermal ageing properties and is particularly suitable for heated floors and prepared plywood sheets. 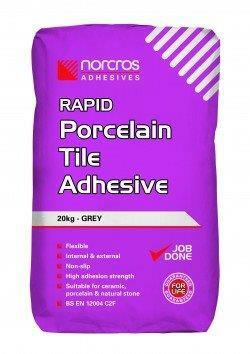 When fixing light coloured stone use a white adhesive such as Norcros Rapid Porcelain & Stone White to avoid staining. 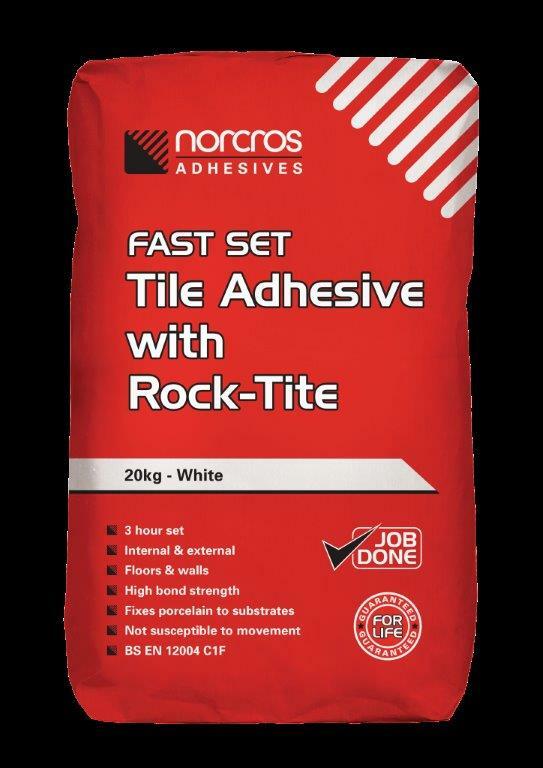 Norcros Fast Set Rock Tite Adhesive is a grey cement based adhesive designed for fixing fully vitrified porcelain, ceramic and stone* tiles to a variety of building surfaces. It is water and weather resistant and is suitable for both internal and external locations. It has a setting time of 3 hours permitting early trafficking of the installation. The performance of Fast Set Rock-Tite Adhesive is significantly improved with the addition of Norcros Adi-Flex polymer admixture which allows a greater range of fixing possibilities to difficult substrates including heated floors, old tiles and certain timber sheets. Norcros One Part Flexible White is a highly polymer fortified adhesive mortar for use on walls and floors in both internal and external locations. It requires only the addition of water as it is specially formulated with Rock-Tite™ polymeric binders to impart flexibility, water resistance and increased strength – usually only achieved by the addition of polymer admixtures. 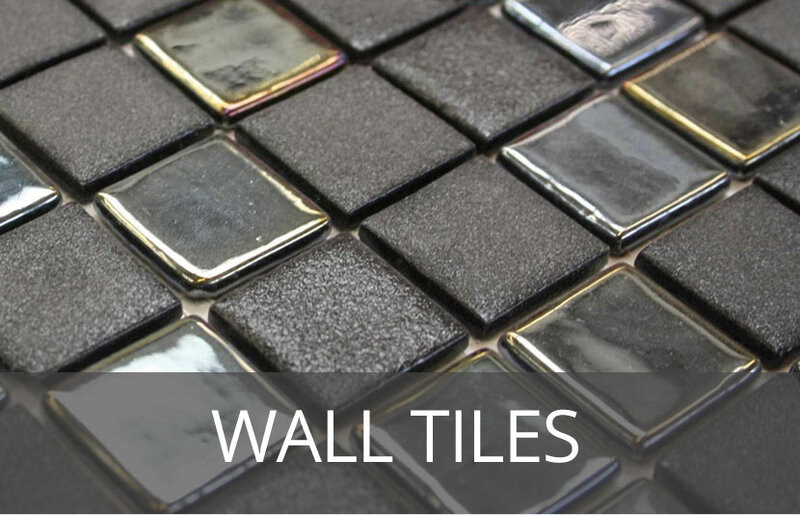 It is ideal for tiling in heavy duty areas such as swimming pools, commercial showers and locations where thermal variation may occur. Norcros One Part Tile Direct to Wood Adhesive is a 1-part highly flexible rubberised thin bed wall and floor tile adhesive specifically designed for fixing fully vitrified porcelain, ceramic and dark natural stone tiles to substrates where background movement, vibration or thermal movement precludes the use of conventional polymer modified cement-based adhesives. It is water-resistant and is suitable for use in both internal and external locations. It has a setting time of 3 hours at 20oC, permitting early trafficking of the tiled installation. The adhesive has excellent thermal ageing properties. 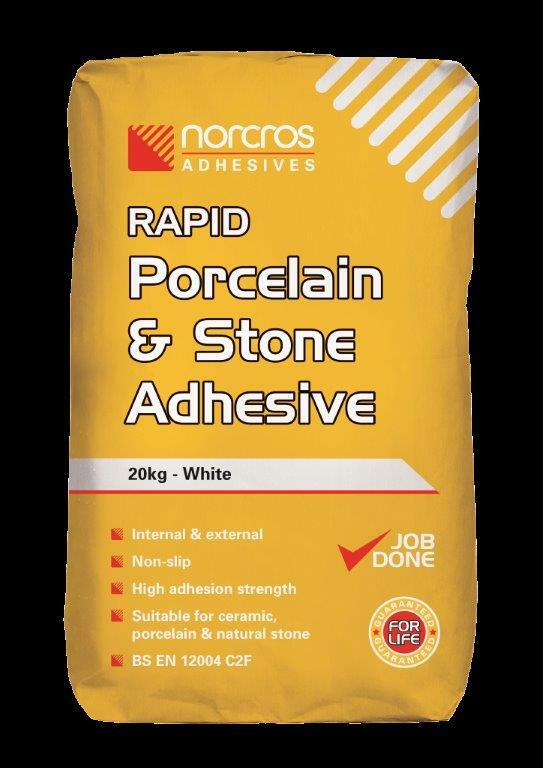 Norcros Rapid Porcelain & Stone White Adhesive is a white cement-based thin bed adhesive designed for fixing fully vitrified porcelain, ceramic and stone tiles to a variety of building surfaces. It is water and weather resistant and is suitable for both internal and external locations. It has a setting time of 3 hours at 20oC permitting early trafficking of the tiled installation. Containing unique Rock-Tite™ polymeric binders the enhanced flexibility of the adhesive allows a greater range of fixing possibilities normally only achieved by the addition of separate admixtures. The adhesive has excellent thermal ageing properties and is particularly suitable for heated floors and timber floors when overlaid with WBP/Marine grade plywood. *When fixing light coloured stone use a white adhesive such as Norcros Thick Bed Stone & Porcelain White or Rapid Porcelain & Stone White to avoid staining. Norcros Thick Bed Porcelain & Stone White Floor Tile Adhesive is a white cement based thick bed floor adhesive designed for fixing fully vitrified porcelain, ceramic and natural stone* tiles to a variety of floor surfaces. Its shrinkage compensating deep bed formulation makes it ideal for the installation of large format tiles and slabs affording excellent area contact without the need to back butter. It is water and weather resistant and is suitable for both internal and external locations. 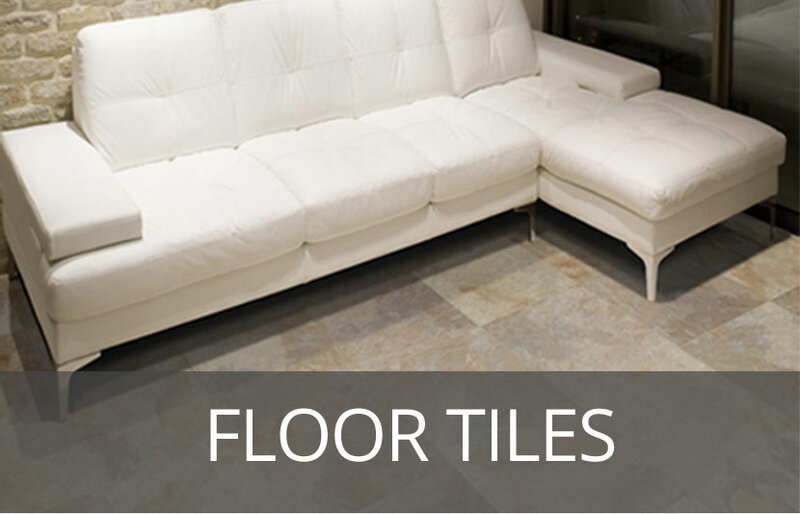 It has a setting time of 3 hours permitting early trafficking of the tile installations. Containing unique Rock-Tite™ polymeric binders, the enhanced flexibility of the adhesive allows a greater range of fixing possibilities normally only achieved by the addition of separate admixtures. The adhesive has excellent thermal ageing properties and is particularly suitable for heated floors and timber floors when overlaid with WBP/Marine grade plywood. 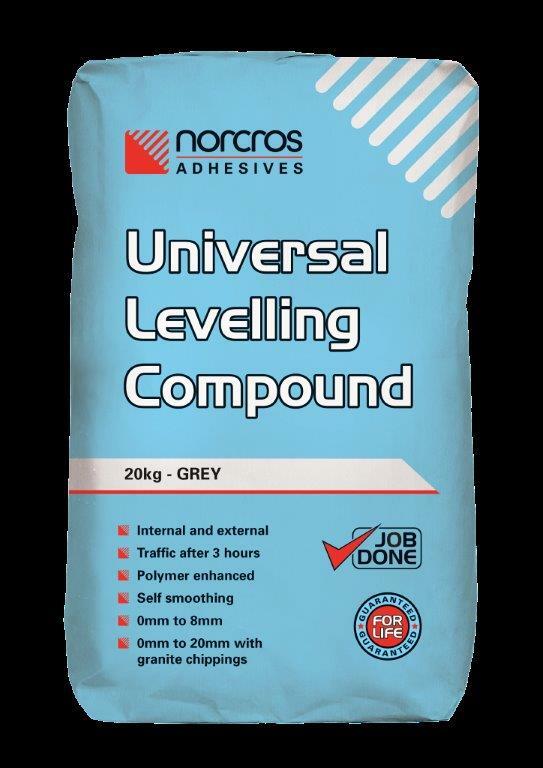 Norcros Universal Levelling Compound is a single part polymer modified self-smoothing floor levelling compound. It is suitable for levelling a variety of substrates including concrete, cement: sand screed, flooring grade asphalt, terrazzo and existing quarry and vinyl tiles. 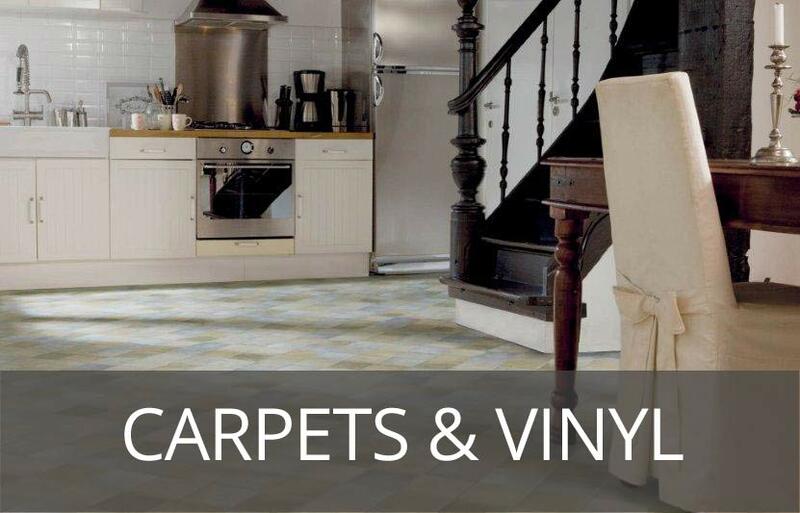 It is ideal for use with under tile heating mats where it may be used to cover the wired elements, providing a level substrate to tile to and also protecting the heating elements during the fixing process. 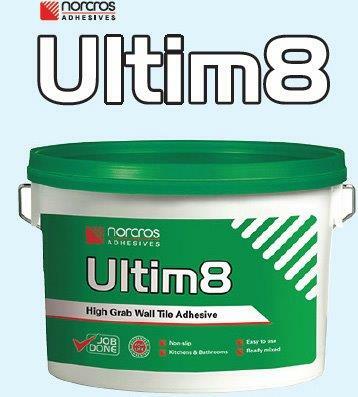 Its excellent levelling and flow properties make it ideal for preparing sub floors prior to fixing ceramic, porcelain or natural stone tiles or soft floor coverings such as carpet, vinyl and timber. It has a setting time of 3 hours permitting early foot traffic and fast track tile fixing. The product is designed to be used from 0 to 8mm thick in one coat, or with the addition of single sixe granite chippings up to 20mm. 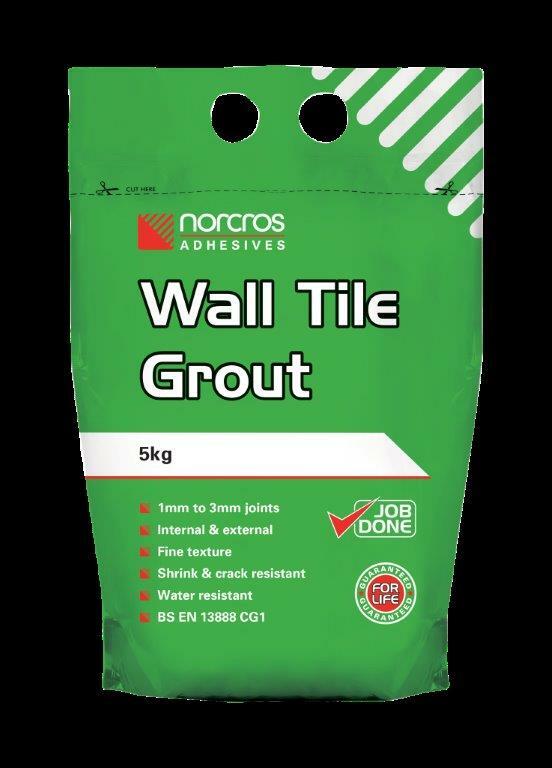 Where an impervious grout joint is required Norcros Super Epoxy Grout should be used. It should also be noted that the Pantone references are not by any means a true match and have been selected for being the ‘closest available’ to the actual grout colours. 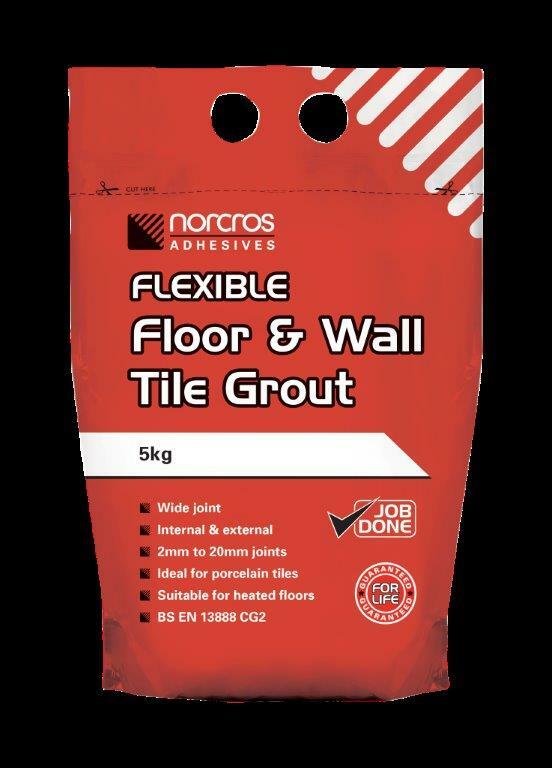 Norcros Floor & Wall Tile Grout can be used in both internal and external conditions and in fully immersed conditions such as pools. It is water resistant but not impervious to the passage of water, in situations where the background needs to be protected against water ingress the use of Norcros Wet Seal should be considered. Where an impervious grout joint is required, Norcros Super Epoxy Grout should be used. Conforms to classification BS EN 13888 CG1. 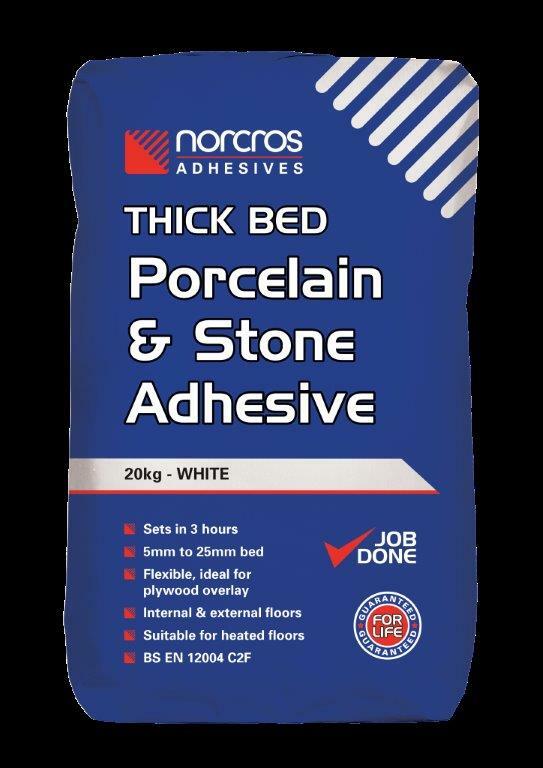 Norcros Wet Seal is a white brush applied tanking membrane specifically designed for use beneath ceramic, porcelain and natural stone tiles and mosaics on both internal walls and floors in installations subject to intermittent and frequent wetting such as domestic and commercial showers, wet rooms and saunas. 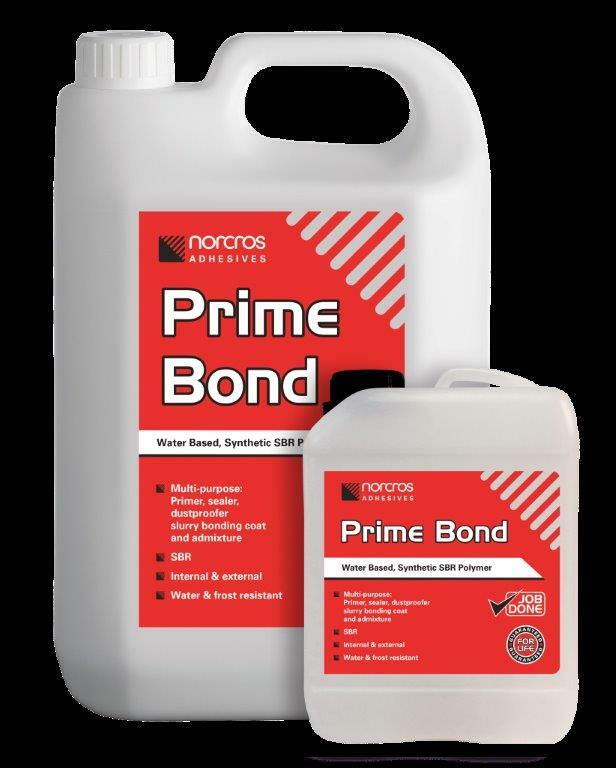 Norcros Wet Seal is sold in kit form, consisting of 5kg of liquid membrane, 500ml of Norcros Prime Bond Primer and 10m of 100mm wide waterproof polyester tape. Additional 5m lengths of 100mm wide tape and 1m x 1m pieces of waterproof polyester matting are available if required. The polyester tape and matting are designed to reinforce the membrane in areas where additional stresses may be encountered such as junctions between walls and floors, changes in plane, internal and external corners, around floor drains and channels and on suspended and timber floors and in heavily trafficked areas. 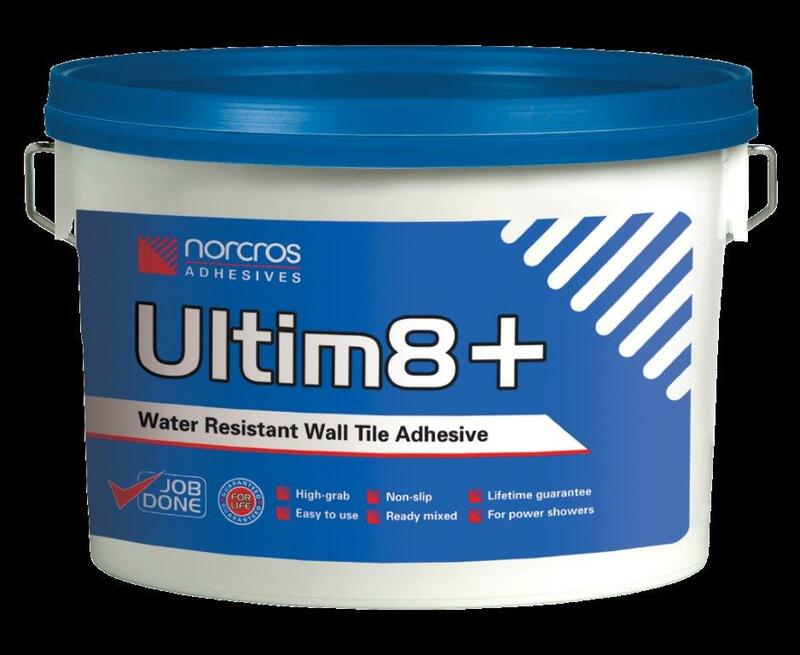 Norcros Wet Seal is suitable for use on all types of substrate for interior tile installations including moisture sensitive backgrounds such as timber, plaster and plasterboard. It is also ideal for use on tile backer boards. N.B. proprietary tile backer boards are designed to remain dimensionally stable during partial/ complete saturation, however they are not impervious to the passage of water until they have been coated with Norcros Wet Seal. 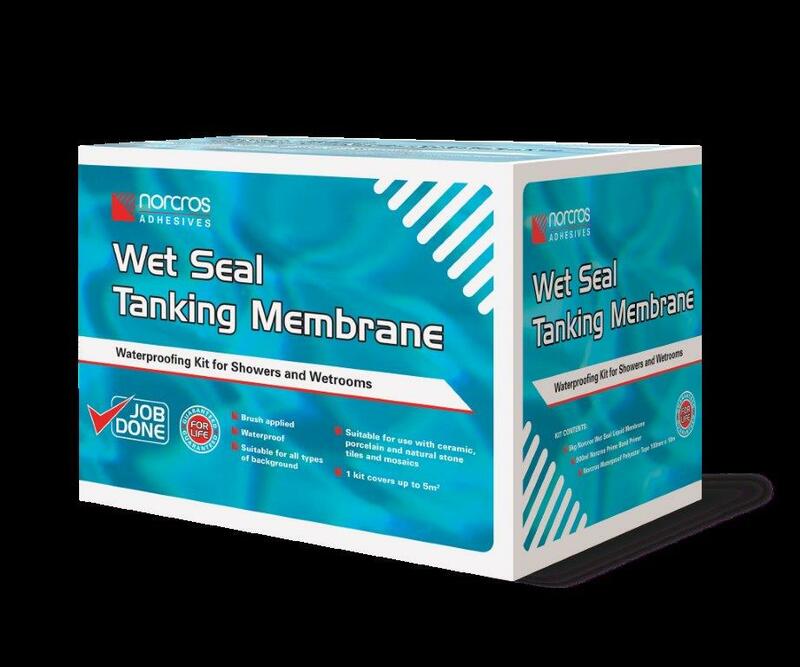 Norcros Wet Seal should not be used externally or in areas of total immersion such as swimming pools. 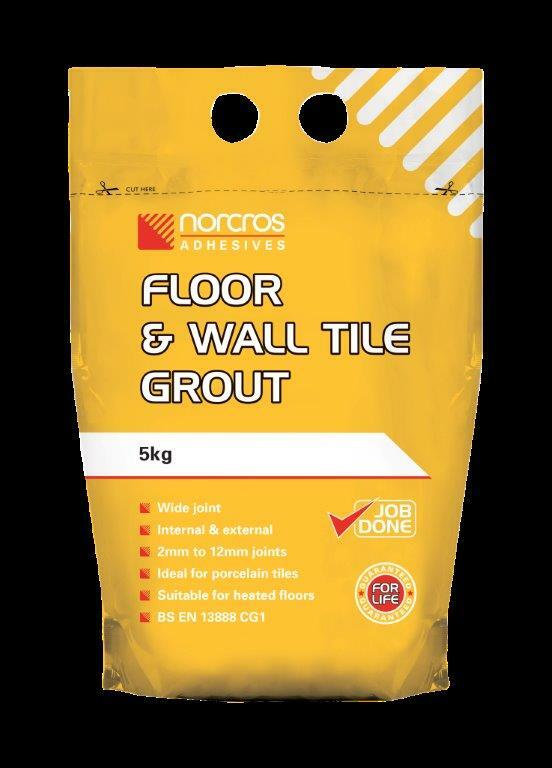 Norcros Wet Seal may be tiled 24 hours after application, however in low temperatures or in areas of high humidity this drying time will be extended.